Another month, another late Sephora Play review. This time my talented and super sweet friend Emily and I teamed up for a collaboration! Emily is amazing, and crazy talented. 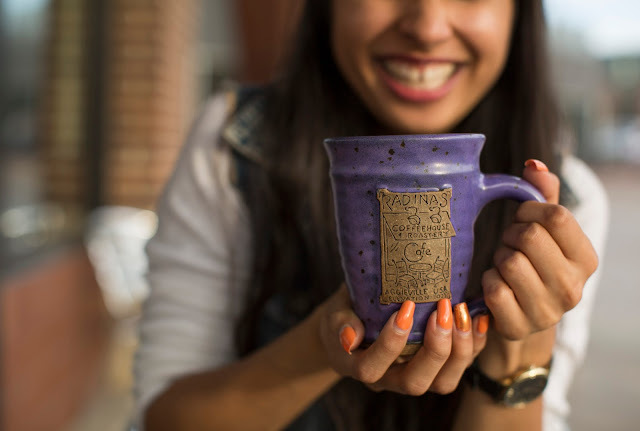 Capturing not only my moody matte flat lays + lattes, but also pictures for the K-State Collegian, check it out here! Most of the time when I do my makeup I have a latte in front of me and NPR playing whilst I’m trying out all these new products. 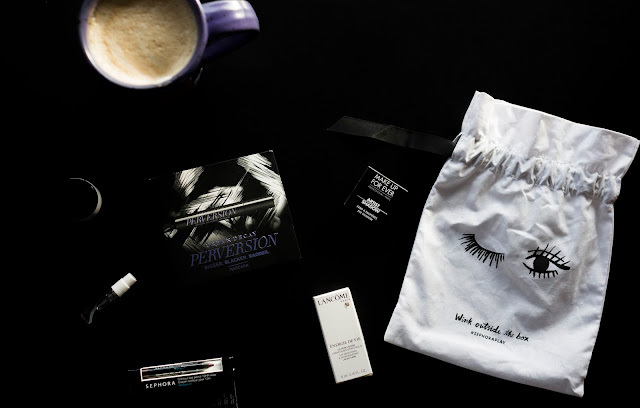 So I thought let’s bring August's Sephora Play box to Radinas (a popular, local coffee house in Manhattan with a cult following). P.S. here are two more fascinating podcasts to listen to 1, 2. As these boxes get more and more popular it’s disheartening to see unfavorable reviews. All in all I love Sephora Play and think it's a great price! 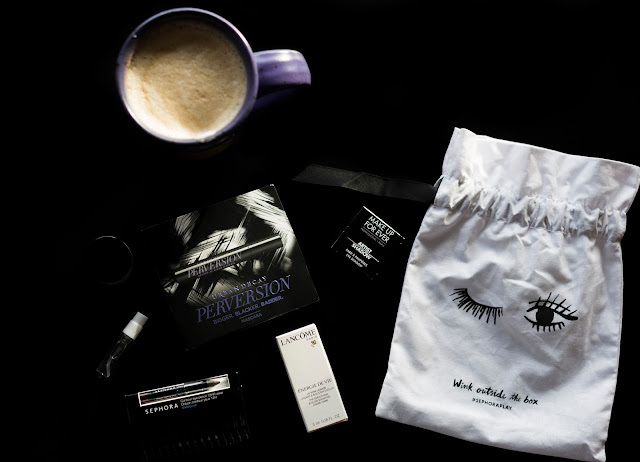 This month I was pretty excited to try so many new shades and products (surprising, huh?). 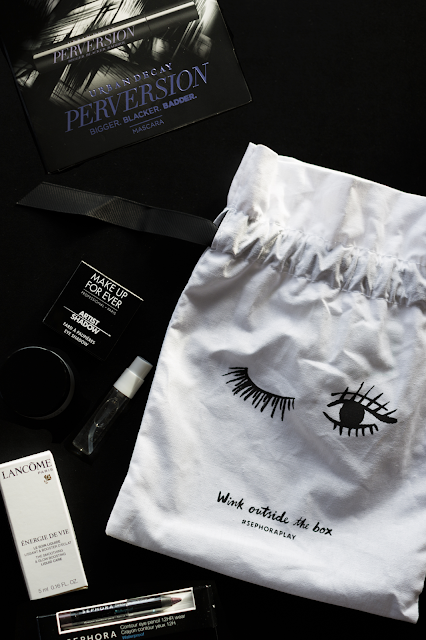 August’s theme was all about eyes, with this adorable “Wink outside the box” pouch. I love trying mascara samples and this mascara’s packaging is 10/10. 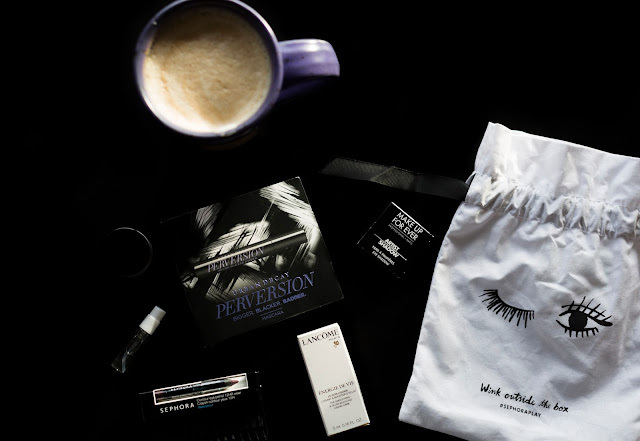 There’s something feisty about gun metal mascara. I didn’t notice anything extra ordinary with this mascara other than that it was lengthening. When I opened this little balm up I nearly squealed. It was filled to the brim with product. I love products that are filled to the top. I think its just good manners. I loved the texture of this eye cream it was so soft and billowy. I didn’t see instance results but my face did feel plumper and better in the morning! Now Pop Chips can someone tell them to fill the bags to the top??? When I put Warm Cotton on today I was surprised. I smelled like a Yankee Candle in the best way possible. I’ve heard this perfume smells like Yankee’s Fluffy Towels (will get back to you). I can’t really explain the nice, fresh (lol) scent of this perfume. I felt like this line lasted longer throughout the day than the other Clean perfumes I've tried. However, I don’t think this is something that will become a signature scent anytime soon but it was very cool to try, and a nice break from my Prada Candy and samples of Tom Ford. I usually am an all matte eye shadow gal. My eye shadow routine can basically be best summarized as the Shade & Light palette by Kat Von D. I was surprised to like this shade instantly. I like this eye shadow because it’s not something I'd pick and it’s wearable. It's a smoky kind of purple but moody, very 90s in my opinion. I put it in my outer lid and outer crease and loved the results. Although I'm fond of Lancome I didn't particularly like this product. Mainly because when I opened it, it started oozing out. I did like this product as a replacement to moisturizer at night. Unfortunately there wasn't anything overwhelmingly noticeable about this product. I love luxe skincare though so I can't complain too much. I loved this eye pencil from the moment I saw it. It’s dark enough to look like a brown or black, but it’s plum! Who would’ve thought? I lined my waterline with Love Affair and although it looked black at first later in the day I loved the little smudged out plum that was left there. I wore this color entirely on a Sunday to work and quite liked it. The formula is awesome, and super creamy. I had a little trouble acing the cat eye with this liner but you can fake the tip of the wing with black felt eyeliner and it looks fine! I did notice that this eyeliner was a little to tricky to take off, my Sephora eye makeup remover was not enough to take this off. 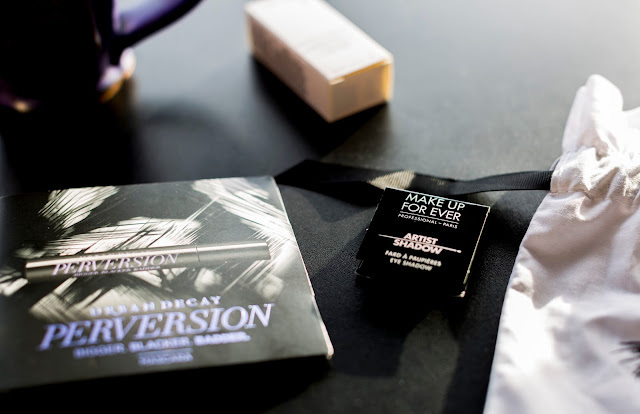 Even paired with Glam Glow Supercleanse I still felt this eyeliner stayed in some crevices. I think what I liked most about this box was the pairings. This eye shadow + eye pencil are perfect together for vampy fall looks. 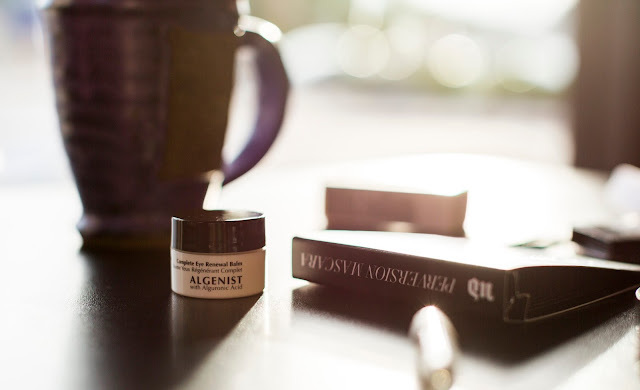 I loved that the Lancome Energie de Vie worked perfectly with Algenist’s Eye Balm. I like the fact that these items all kind of pair together (minus the perfume which I surprisingly liked too). I'm hoping Sephora Play pairs more items together in the future! Wishing you all a healthy, productive, love filled, 72 degree September. See you soon! Great review dear, the products sound great and I love your photographs! Thanks for sharing lovely! Thank you so much Faye, take care! Thanks Amy Ann! Good to know my addiction is normal! I love the cute bag! I love these photos and the drawstring bag is soo cute! Great review pretty, lovely photos and Thanks for sharing your honest review. Great detailed reviews! I will have to try that mascara! Nice review! I'd love to try this out myself!! Thanks! ah you got some great things, love the sound of the eyeshadow! Its amazing you'd love it Cara! Looks nice! Thanks for the review! Thanks Violette it was a cute box this month! It looks like you've got some pretty amazing products, girlie! I'm particularly interested in the eye balm, it sounds great and I always love when products are filled to the brim, too. You made me laugh with the Pop Chips, so true! I also have to check out Radinas the next time I'm in the city, I've never been and I'm a huge coffee drinker! Thanks for sharing and I hope you have a great weekend ahead, beauty! It was great Jalisa! I'll keep you posted on the eye balm. ugh I love Pop Chips, wish there was more in a bag! Take care hope you're doing superb lady! I want Birchbox too Annie =( Thanks for stopping by, here's to! Ahh Radina's!!! You're making me want to go visit Manhattan! Love Radina's. And you're so right, it IS good manners for companies to fill up their products all the way to the top. So true! :) A plum colored liner sounds fun, I want to try that for fall. Enjoy some Radina's coffee for me Sonia!! Thanks Mme! I love Radinas they're so cute. Although I do love Strabucks too! Love the plum liner, I will! That's actually a really good bag and I would be thrilled if I got that. The only thing I dislike is Clean perfume, I'm not a fan of their scents. Thanks Shireen! Ya this one smelled like laundry but I did like it! Oooh such a cool collab with your friend and the flatlay photos are beautiful. Thank you Atsuna, Emily is amazing! I didnt even know sephora had a grab bag of stuff. I'd def like to try it! I love the scent of fresh linen! Sounds like such a great item. This was such a diverse box. I've been hearing a lot about Sephora boxes. I definitely need to give it a try. We are! I'm so excited you get this box too! Twins! Awh I always try them no matter how daunting they seem. I just mix in a bit of purple with a cream eyeshadow (boring but I've come to terms with who I am haha). Also I love your nails! What polishes are you wearing?! Awh thanks! This is OPI Where Did Suzi's Man-Go? from the OPI Brazil collection! I adore this orange, a summer fave. My nail tech put some gold glitter on my ring fingers but its the tap on with a brush kind not the glitter polish kind haha.